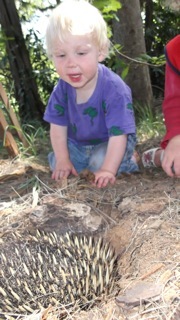 I am gratefu l to her mother, Kate, for this delightful photo of Pippa watching an excavating echidna. Not yet two years of age, Pippa is obviously captivated by what is going on. You can sense the intensity of her interest and excitement. No coaching or prompting was necessary; her mental and emotional connection with the echidna was entirely spontaneous – a splendid example of biophilia in action. We can see examples of ‘biophilic’ behaviour like this all around us – gardening, keeping a pet, looking at nature books and documentaries, paying premiums for homes with water views, visiting beauty spots, holidaying on farms, etc. Behaviour of this kind is characteristic of people everywhere; and Edward O Wilson suggested the concept of biophilia to explain it. A particularly striking example of biophilia in action is our response to flowers. I am sure that you will enjoy this photo of a Waratah taken by Tony Rodd and you would have even more pleasure actually seeing one in the bush (look here for more of Tony’s flower and plant photos). It is a rare person who does not get an emotional lift (the ‘beauty buzz’) from flowers. Professor Jeanette Haviland-Jones has studied this response by observing people’s reactions to floral gifts. The pattern of behaviour she describes is amazingly consistent from one person to another. There is a genuine (Duchenne) smile that involves the eyes as well as the lips; there are feelings of pleasure and there is a boost to happiness, which may last for hours or even days. According to Professor Haviland-Jones, this is a hard-wired response that exists because it helped our ancestors survive as hunter-gatherers. In nature, flowers and food in the form of fruit, nectar, leaves, roots and seeds go together, so an attraction to flowers would have made food gathering easier. Biophilia disposes us to experience flowers as beautiful and beckoning just as it stirred Pippa’s fascination with and curiosity about with the echidna. It only takes a handful of these features to make natural scenes attractive. Take the scene that I have used in the banner for my blog, for example. It is a scene dominated by a beautiful and tranquil body of water. The way the river disappears around the distant bend makes it an enticing scene as well. It is not difficult to imagine that if you were actually there by the Kowmung River, you would be tempted to stroll along the river’s grassy banks down to the bend to see what was beyond. Or you might be content simply to sit by the rocks in the foreground, gaze at the scene and perhaps engage in a spot of reverie and reflection. Scenes like this have universal appeal. Research consistently shows that people prefer to look at such scenes rather than views of roads and buildings and other typical urban features. This is the case regardless of people’s ethnic and cultural backgrounds. Looking at natural scenes gives people ‘a better feeling’. I have no doubt that we are intended by Nature to enjoy the natural world. Evolution has crafted our brains to this end. But most of us no longer live in the world of Nature. As Geraldine Brooks said in the first of the 2011 Boyer Lectures, ‘The bodies and minds we inhabit were designed for a different world to the one we occupy…We have left our home behind and ventured into an alien world. And we don’t yet know what effects this sudden hurtle into strangeness will ultimately have on the human body, the human mind’. Well said, but we do not have to abandon the natural world altogether. There are choices we can make and action we can take to retain our connection with Nature. And, as both poets and scientists tell us, it is a connection well worth nurturing.